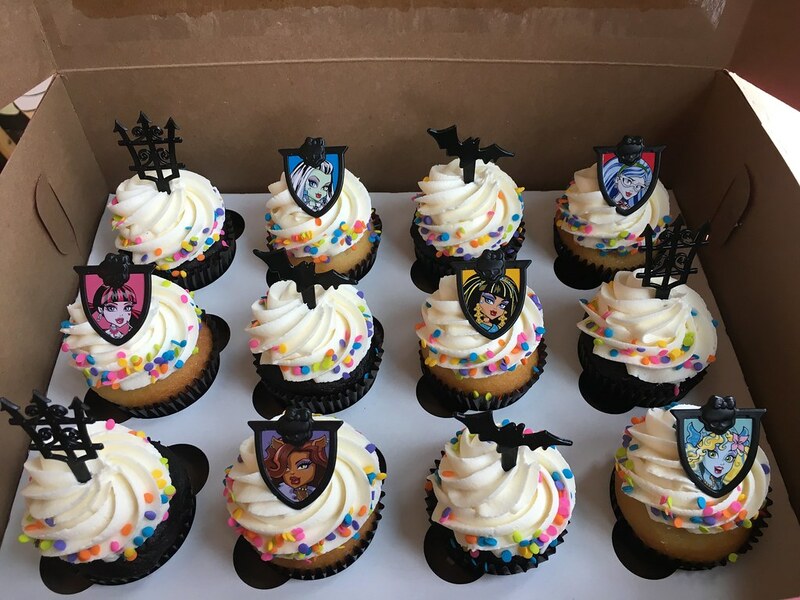 my little cupcake ﻿﻿﻿specializes in delicious mini cupcakes for every occasion in your life! All of our little confections are made from scratch with ❤️ using local & premium ingredients such as King Arthur unbleached flour, Cabot butter, Callebaut chocolate and cocoa powder, Vermont maple syrup, Green Mountain pure exacts, Hood milk, Domino sugar, and Shadow Cross Eggs. We use fresh, natural ingredients and never use preservatives! $32.00 per 2 dozen. If you would like to place an order for a specific flavor, it must be by the 2 dozen with at least 48 hours notice. If you would like an assortment, feel free to come into the bakery and choose from the 12 rotating flavors we have daily! The perfect favor for you wedding guests! 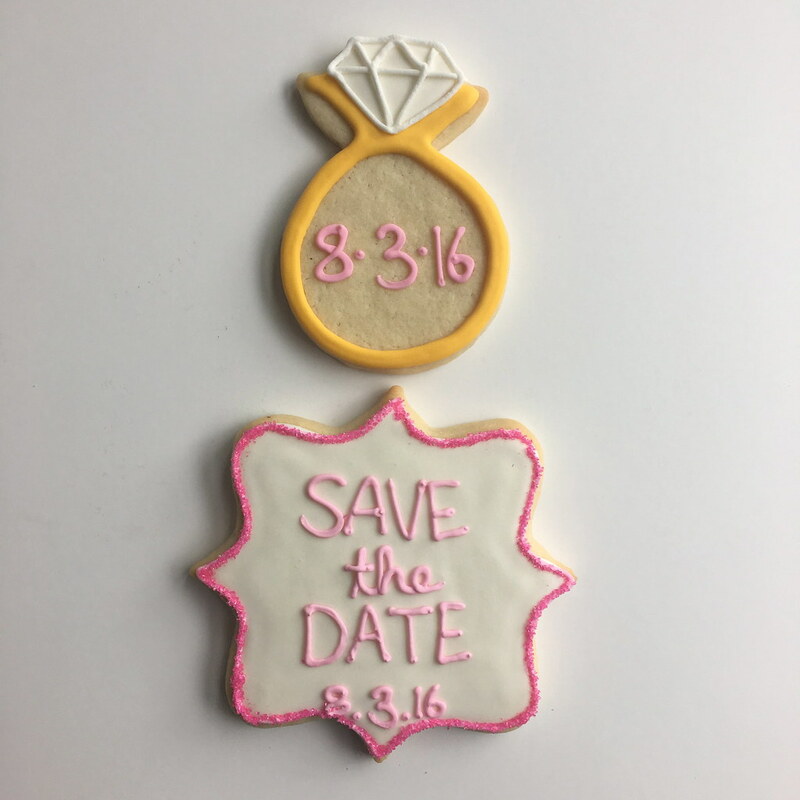 Let your family and friends know about your big day in the most delicious way! 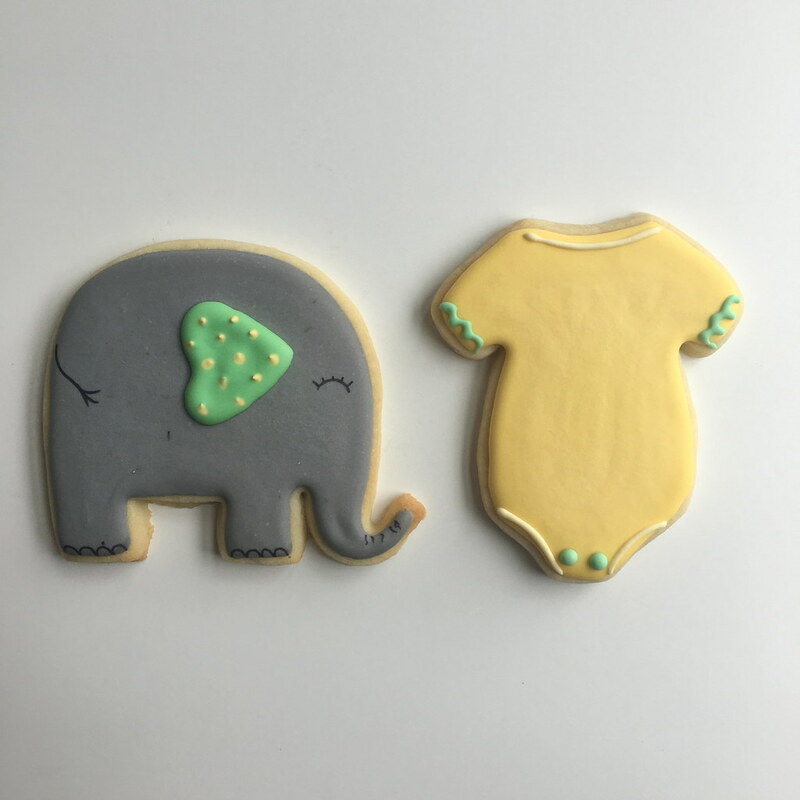 These adorable cookies will add the perfect amount of sweetness to your baby shower! Looking for something else to complement your party or event? Just call our Burlington bakery at (802-660-9330) and ask about custom orders! 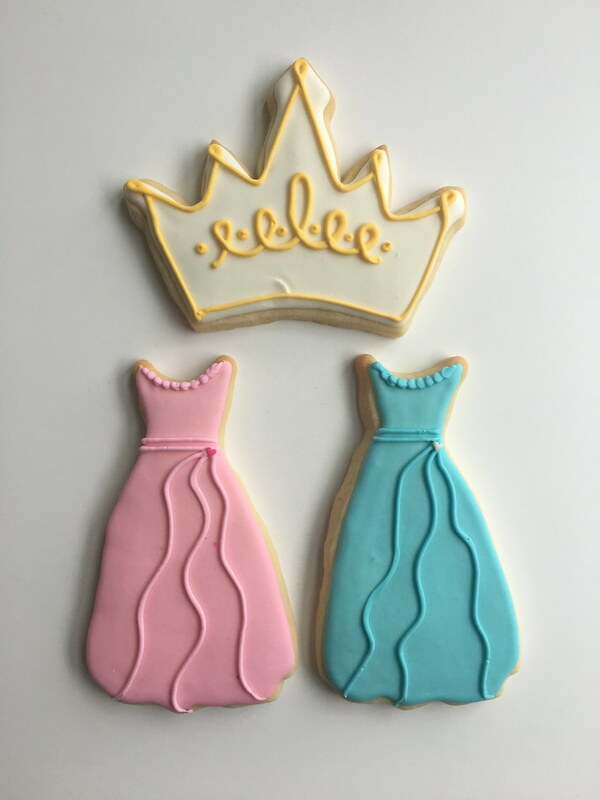 Our sugar cookie decorator, Sarah, will work with you to create something special for your event. 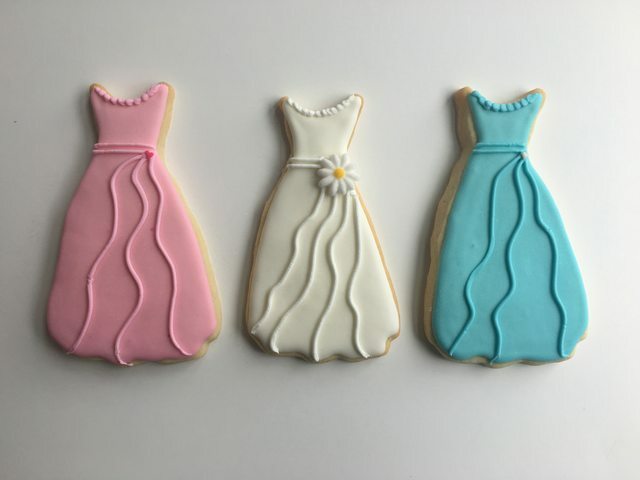 See more examples of our sugar cookies here! 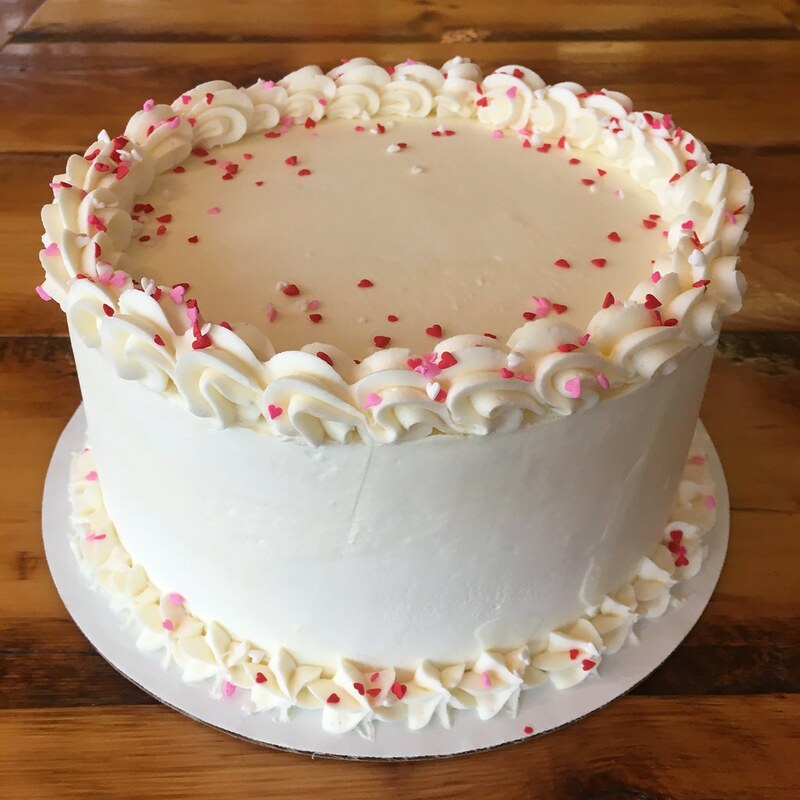 Three layers of chocolate cake with vanilla buttercream and tiny heart sprinkles. Three layers of chocolate cake with chocolate buttercream and colorful diamond sprinkles. We are proud to partner with Brio Coffee and offer French press coffee and lattes to order. 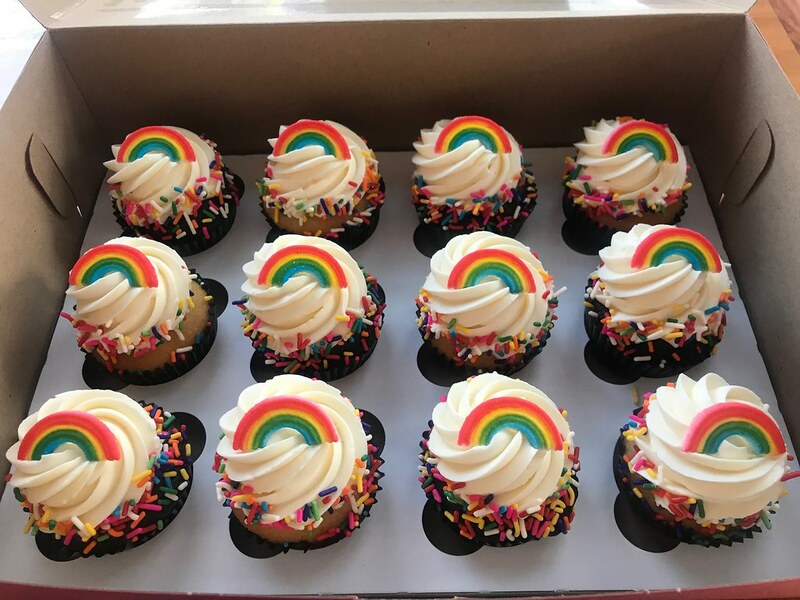 12 regular size cupcakes-6 chocolate and 6 vanilla topped with vanilla buttercream, sugar rainbows, and sprinkles. 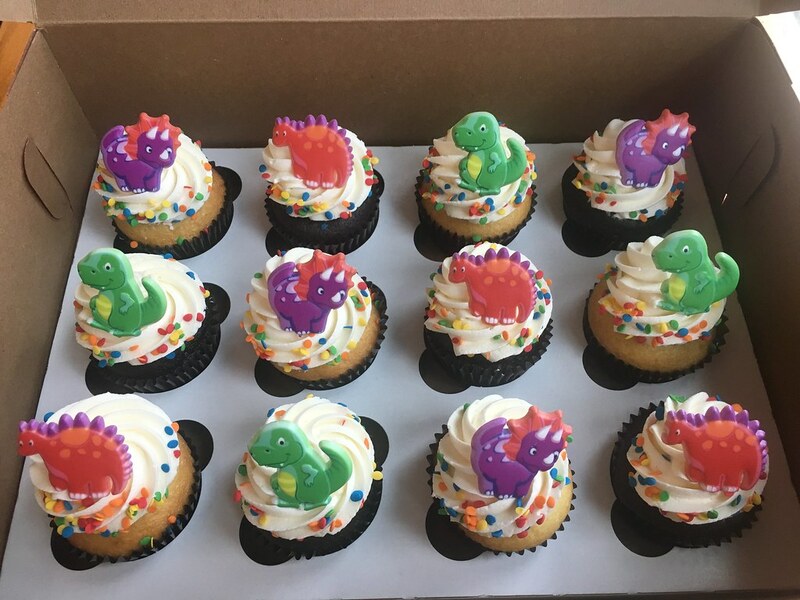 12 regular size cupcakes-6 chocolate and 6 vanilla topped with vanilla buttercream, plastic dinosaur rings, and sprinkles. 12 regular size cupcakes-6 chocolate and 6 vanilla topped with pink vanilla buttercream, plastic princess and crown rings, and sprinkles. 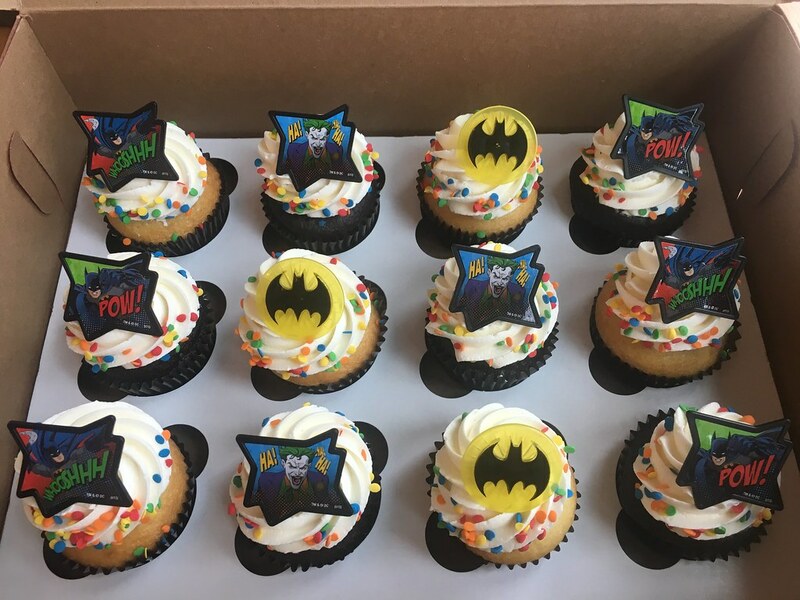 12 regular size cupcakes-6 chocolate and 6 vanilla topped with vanilla buttercream, plastic Batman rings, and sprinkles. 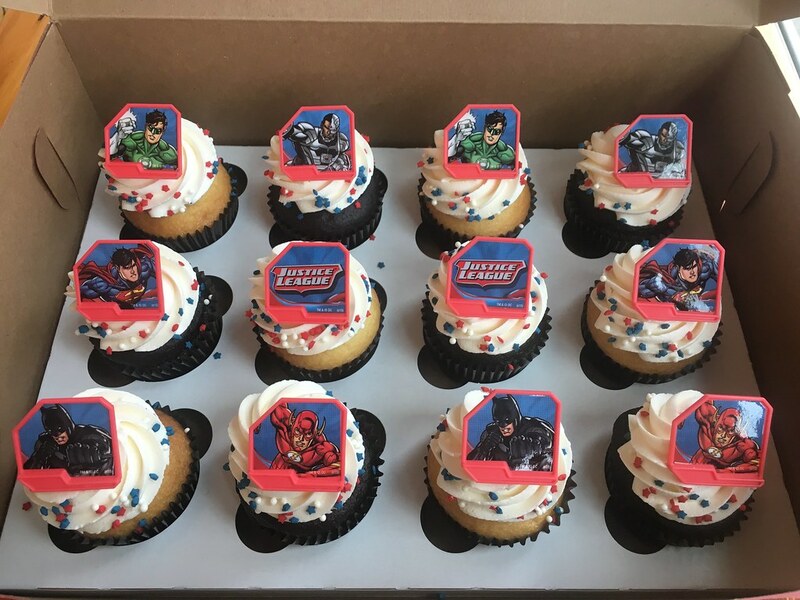 12 regular size cupcakes-6 chocolate and 6 vanilla topped with vanilla buttercream, plastic Justice League rings, and sprinkles. 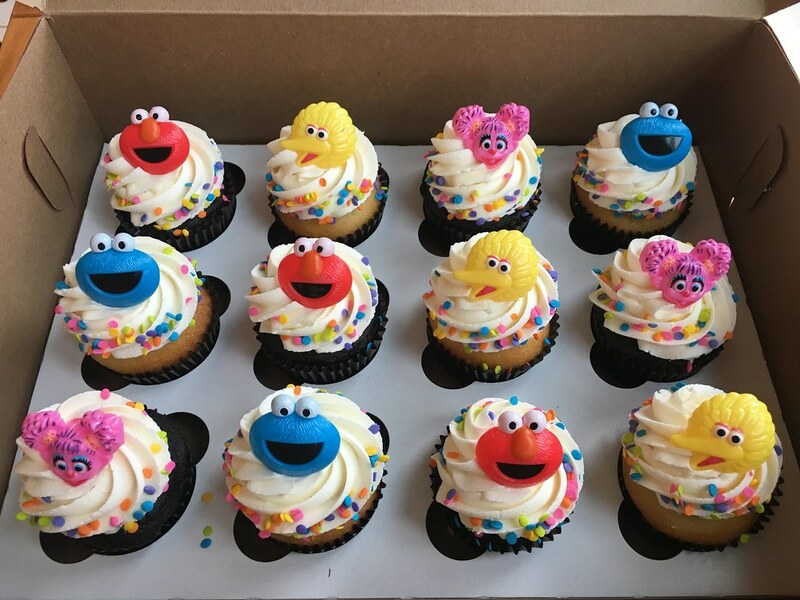 12 regular size cupcakes-6 chocolate and 6 vanilla topped with vanilla buttercream, plastic Sesame Street rings, and sprinkles. 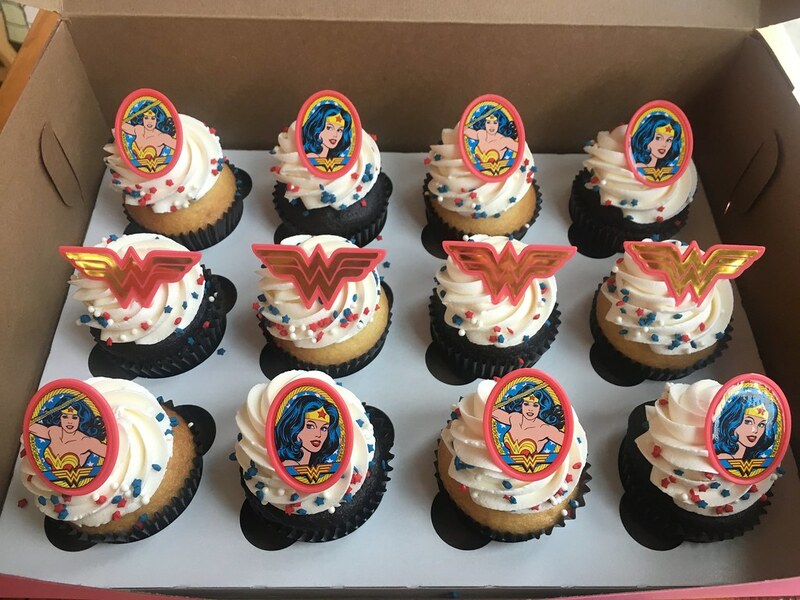 12 regular size cupcakes-6 chocolate and 6 vanilla topped with vanilla buttercream, plastic Wonder Woman rings, and sprinkles. 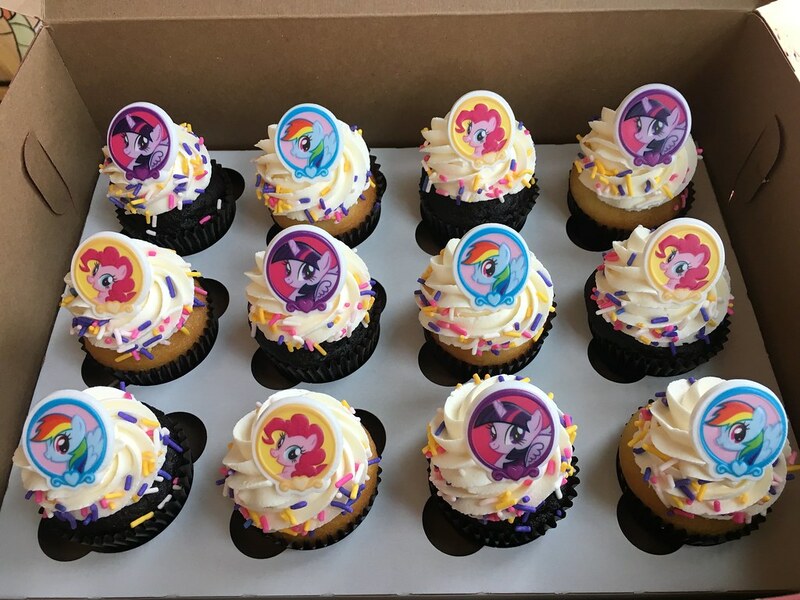 12 regular size cupcakes-6 chocolate and 6 vanilla topped with vanilla buttercream, plastic My Little Pony rings, and sprinkles. 12 regular size cupcakes-6 chocolate and 6 vanilla stuffed with your gender reveal color and topped with vanilla buttercream, plastic penguin rings, and sprinkles. 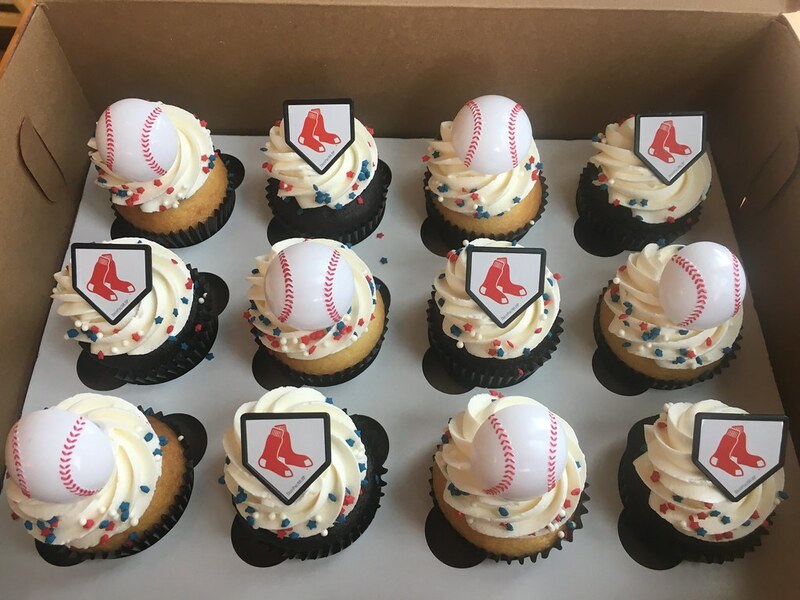 12 regular size cupcakes-6 chocolate and 6 vanilla topped with vanilla butter cream, plastic Boston Red Sox logos and baseball rings, and sprinkles. 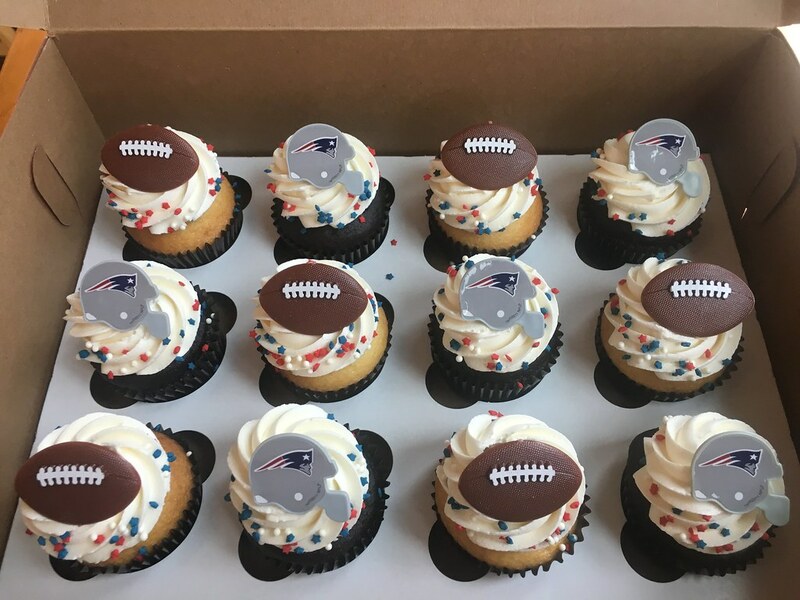 12 regular size cupcakes-6 chocolate and 6 vanilla topped with vanilla buttercream, plastic New England Patriots logos and football rings, and sprinkles. 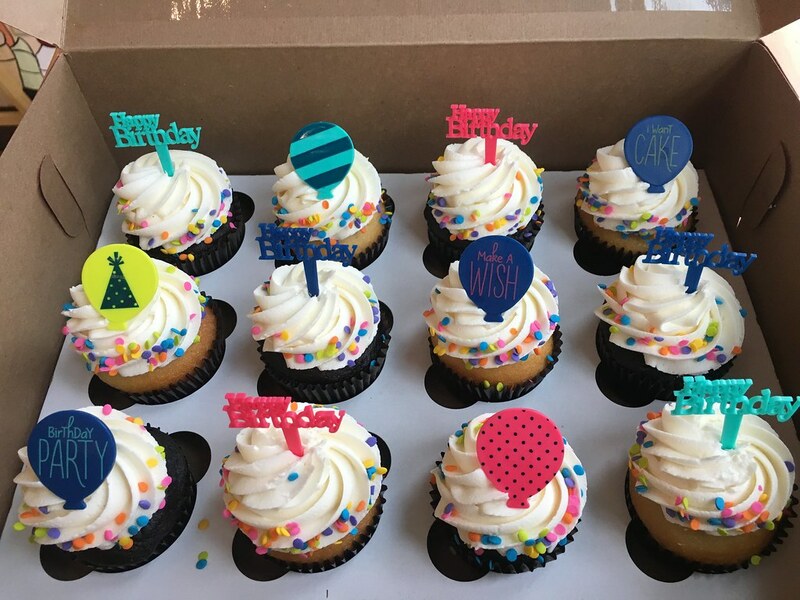 12 regular size cupcakes-6 chocolate and 6 vanilla topped with vanilla buttercream, plastic Happy Birthday toppers, and sprinkles. 12 regular size cupcakes-6 chocolate and 6 vanilla topped with vanilla buttercream, plastic Monster High rings, plastic spooky toppers, and sprinkles. 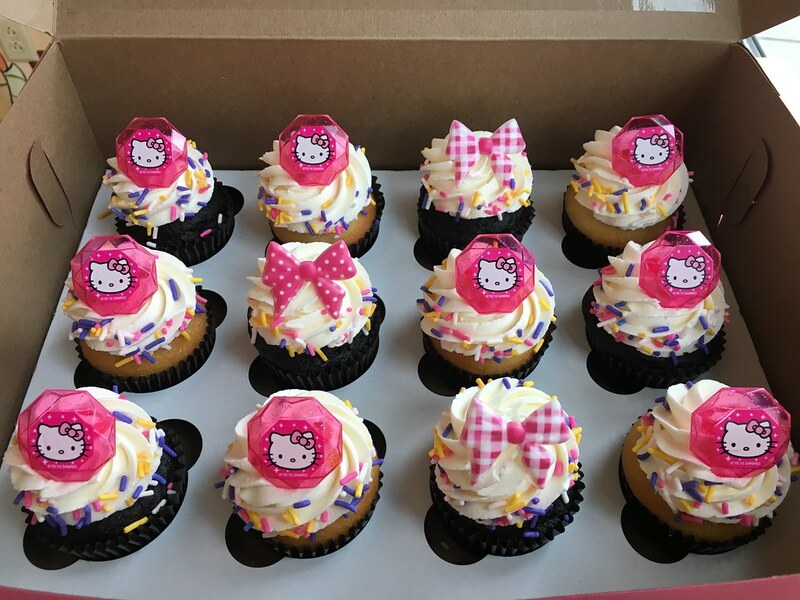 12 regular size cupcakes-6 chocolate and 6 vanilla topped with vanilla buttercream, plastic Hello Kitty and bow rings, and sprinkles. Congratulations and thank you for considering my little cupcake for your special day! 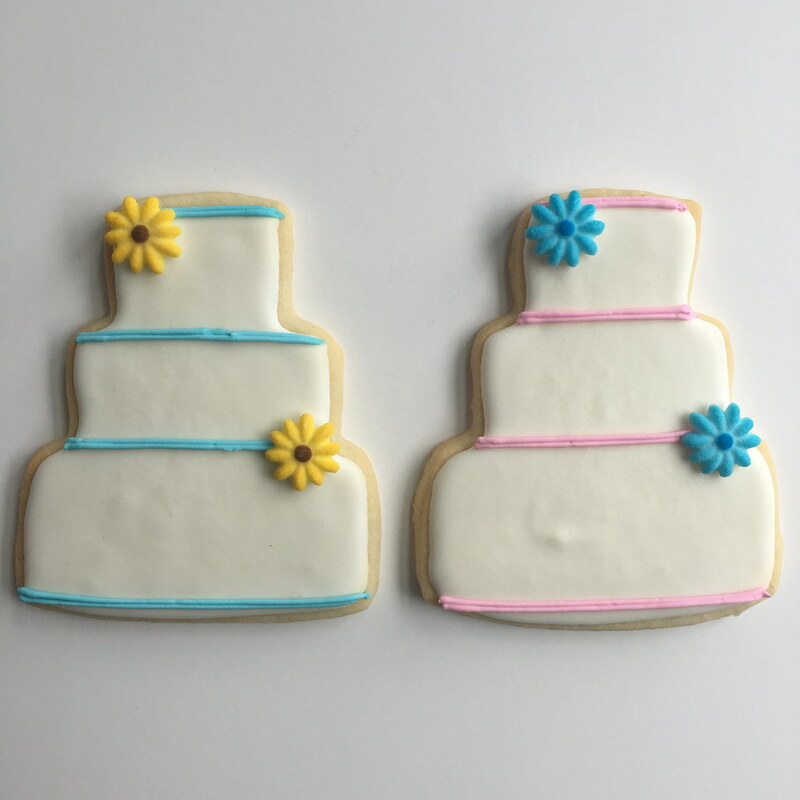 Let us help make your special day sweeter! For inquiries or to schedule a tasting, please call our bakery and ask for Kira (802) 660-9330. 6 complimentary cupcake flavors can be chosen from our pastry case to taste at the bakery. We offer delivery, please call us for details! There is a $50 non-refundable deposit to hold your wedding date. Please note there is a maximum of 6 flavors on all orders over 150 cupcakes. We also have table tiers to display your wedding cupcakes available to rent. my little cupcake is happy to provide delivery services to our customers in the downtown burlington area. 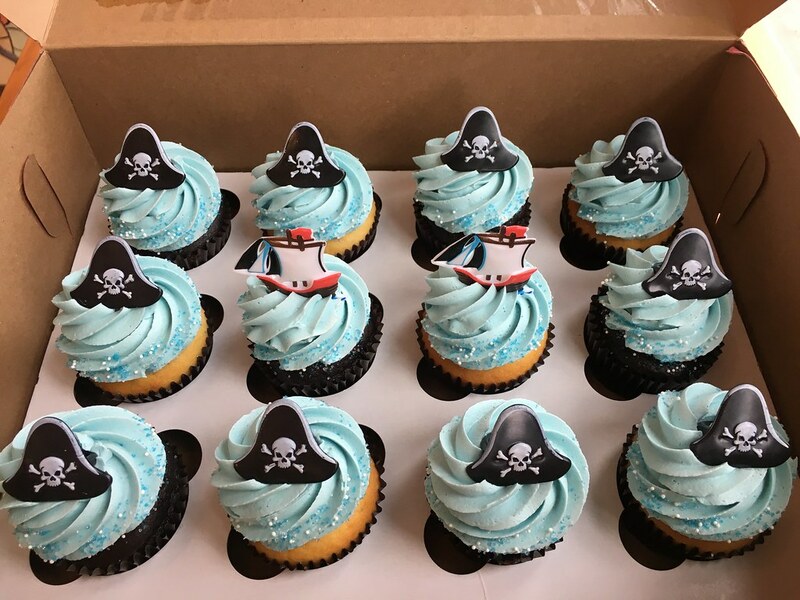 Our partnership with ﻿Lightning Couriers* is the perfect solution when you can’t get to our shop and need cupcakes delivered to that special someone! We are able to deliver Monday-Friday, 11am-4pm. Saturday hours/rates may vary, please call (802) 660-9330 for a quote or to place a delivery order. OUTSIDE OF ZONES - Please call for a quote! *Lightning Couriers are a locally-owned delivery service in Burlington, VT.
My Little T-Shirts & Gifts! my little cupcake has a one-of-a-kind collection of cute little trinkets & gifts available in our Burlington bakery! From our famous t-shirts & baby onesies to cupcake toppers & accessories. We also have a wide selection of Japanese stationery, stickers, pens & cards. We've got just the special little gift you need to go along with our mini cupcakes! Our whimsical, locally screen-printed t-shirts (by New Duds) are the perfect way to share your cupcake obsession! 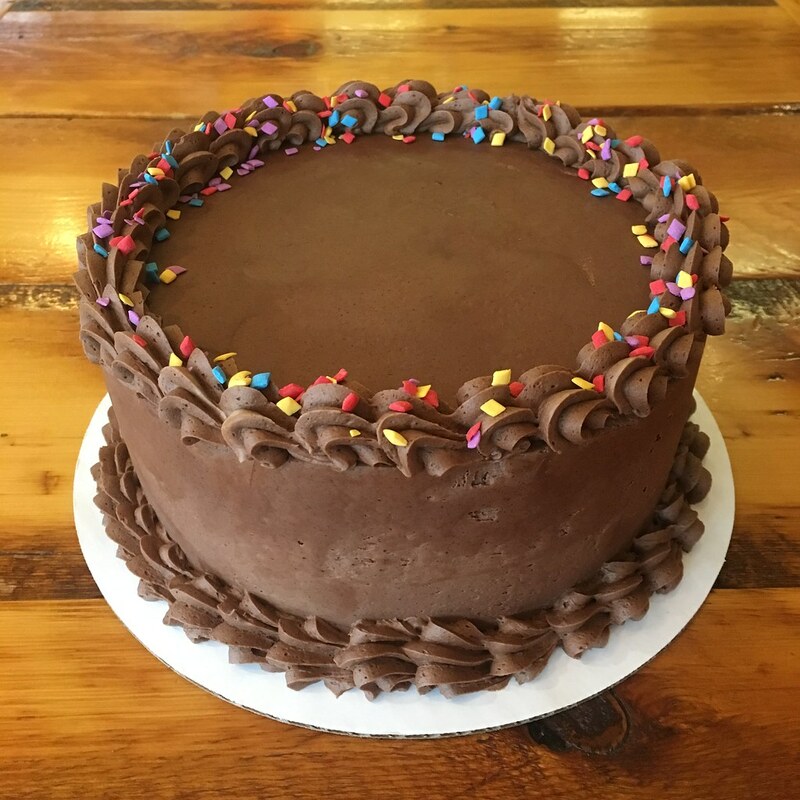 Please call our Burlington bakery at 802-660-9330 or stop by our shop located at 217 College Street in Burlington, VT. Because of our busy baking schedule, we don't always have someone available to check our email or facebook messages daily. Please call us to discuss or place an order. We require a minimum of 48 hours notice for special orders. Specific flavor requests must be ordered in batches of 2 dozen. For example, if you'd like to order carrot cake cupcakes, you would have to order 2 dozen because that is how much our recipe makes. However, we make 12 different flavors of cupcakes daily, so you can always stop by the bakery and pick out an assortment from our pastry case. How long do your cupcakes last? We make our cupcakes with love, not preservative,s therefore they are best enjoyed the same day they are made. Cupcakes can last up to 2 days if stored in an air tight container. 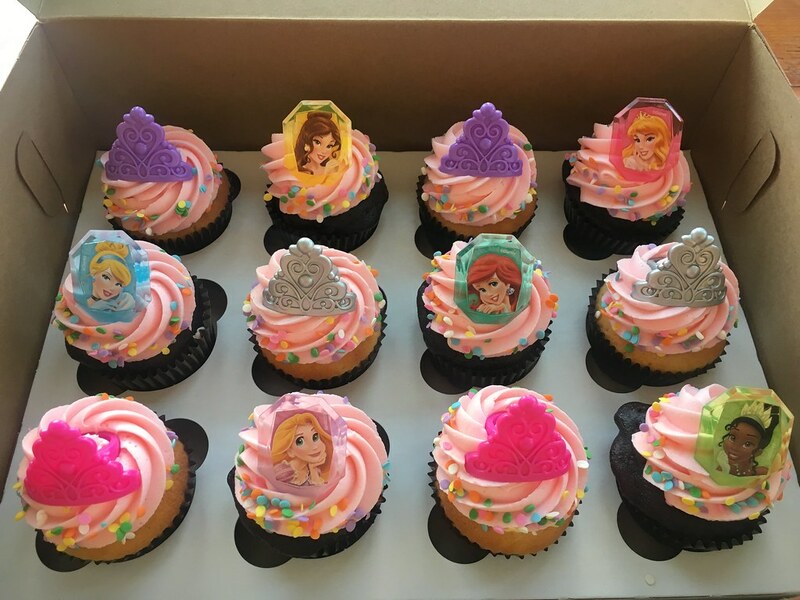 Our cupcakes are best enjoyed the same day they are made; however, if you do not plan to consume your cupcakes the day you buy them then you should either transfer them to an air tight container or wrap the box they come in with plastic wrap. We do not recommend refrigerating our cupcakes as it tends to dry out the cake. We love making cupcakes for weddings! We accept a maximum of 4 weddings per weekend and generally book to capacity during wedding season, so contact us today to discuss your special day. Please contact Kira in Burlington at 802-660-9330 to book a consultation for your wedding. All of our cupcakes are made using equipment that process nuts. We can not guarantee any of our cupcakes will be nut free. Unfortunately, our cake pops are not nut free. With the exception of our vegan options, all of our cupcakes are made with eggs, milk and butter. We make gluten-free cupcakes & cakepops but we are not a wheat-free bakery. We cannot guarantee that anything in our bakery has not come in contact with wheat so if you or your loved one has a severe wheat allergy we do not recommend you consume our products. my little cupcake makes every effort to give back to the community, as we believe we are here because of you! As you might imagine, we receive numerous donation requests from a variety of organizations and individuals, and unfortunately, it is not possible for us to fulfill all of those requests. In order to evaluate all of these requests, we ask that a donation request form be filled out to provide us with all the important information needed for consideration. Please email us for a copy of our donation request form at info@mylittlecupcakevt.com with Donation Request Form as the subject. Please allow 10 to 14 business days to review your request. Copyright 2016, my little cupcake, all rights reserved.